The science fiction writer Arthur C. Clarke made his living sketching out the plausible consequences of future inventions. He once said that imagining the automobile was very easy because everyone could imagine a horseless carriage. 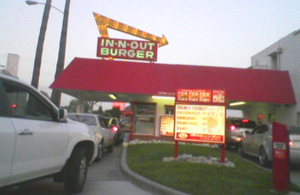 What was hard – and what he saw as the job of science fiction writers – was to imagine the consequences of everyone having a car – the vast parking lots and drive-thru services that were birthed by an auto-centered life. [A] second kind of prophetic failure is less blameworthy, and more interesting. It arises when all the available facts are appreciated and marshaled correctly – but when the really vital facts are still undiscovered, and the possibility of their existence is not admitted…. [Augustine] Comte decided that the stars could never be more than celestial reference points, of no intrinsic concern to the astronomer. Only in the case of planets could we hope for any definite knowledge… Comte would probably have decided that such a science as “astrophysics” was a priori impossible. Yet within half a century of his death, almost the whole of astronomy was astrophysics. Comte cannot be blamed for not imagining the spectroscope; no one could have imagined it, or the still more sophisticated instruments that have now joined it in the astronomer’s armory. Atomic fission was another unexpected invention. Imagine telling someone, even a scientist up to 1939, that you could unleash the energy stored in a ten thousand tons of coal by banging two pieces of special metal together. Based on what they knew about conservation of energy they would have declared it absurd. In this same book (p.20) Clarke offered an incomplete list of inventions which he designated either as Unexpected and Expected. Keep in mind the book was published almost 50 years ago (1963). Clarke did not base his comparison on any data that I am aware of. He wasn’t scouring the literature for the earliest reference of an imagined invention, or noting its absence. Rather he applied a “perplex the ancient” test. 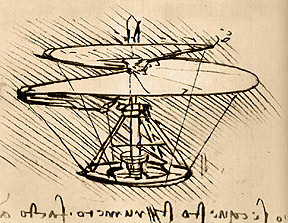 He asked himself if a brilliant inventor in the past like Benjamin Franklin or Leonardo DaVinci were to encounter this modern invention would they be completely confounded and perplexed, or would they grasp its basic function and workings? Although they probably could not understand how teleportation works (we don’t either! ), they would grasp the basic idea. 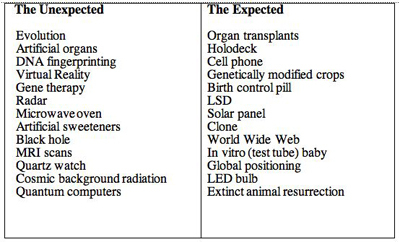 Using the same criteria, I have made my own list of the unexpected and expected inventions and discoveries in the last 45 years (and a few Clarke forgot). My choices, too, are subjective, but follow the “perplex the ancient test.” For instance, genetically modified crops would surprise no one, because the technique is simply breeding by another means. On the other hand, the underlying concepts of DNA fingerprinting would be mysterious, magical, problematic, and take great lengths to explain. The World Wide Web is the long sought after universal library and answer machine. But virtual reality doesn’t have a good analogy. 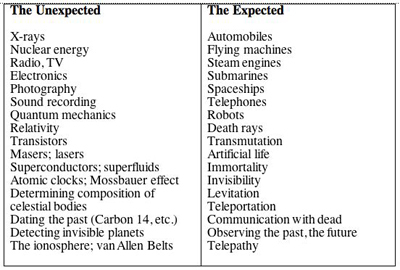 Mulling over the two lists, I think what makes an invention “expected” is if it has a good analogy to some commonplace activity or fantasy that we can visualize right now. Danny Hillis, the inventor of the hard-to-imagine parallel super-computer, first brought to my attention how important it was to be able to visualize – with a picture in our mind – a future innovation. Radar, black holes, atomic power, quantum computers all operated with invisible forces that make seeing them hard. If true, this insight would point to a prediction: that the most unexpected inventions in the future will be based on forces that are still invisible now (quantum, atomic, radio), or wholly new forces that are invisible to the common person. On the other hand inventions that rely on functions we can visualize – like swallowing a pill – won’t surprise us. There’s almost nothing that a pill can do, including making us invisible, that would surprise us. Conversely, there is probably nothing that quantum computation will do that won’t perplex us. … and what about structuration and the example of the one way or the other. The appropriateness of an invention is an interesting yet a diverse dilemma. Pretty much all of the problems of the automobile existed with the carriage, parking, exhaust pollution (horses have exhausttoo you know), fuel problems, etc. There were less collition issues because the horse has built in NI.